In the past two months, I've gone bananas for Copic markers. I can't say enough good things about them. They look so great that I'm more motivated than ever to draw. My collection was on the verge of outgrowing my small, boxy zip pouch I'd been keeping them, so I had to think of a home for them. While browsing Jet Pens (one of my favorite shops for art supplies), I came across the Sun-Star Delde Slide Pen Pouch. The pouch stores pens vertically and converts to a standing pen cup. Cue heart eyes! Perfect! The only issue was the size. I needed a taller size to accommodate some of my pencils, so I went the DIY route. It took some experimentation and guess work, but eventually I figured out a serviceable dupe solution. My version measures 8" tall, 4" wide, and 2.5" deep. Firstly, for your exterior pouch fabric, I suggest using something more durable than quilting cotton. A cotton/linen canvas or something like Essex linen would be good. Second, interfacing matters. I tested this bag multiple times with different interfacing options, and Peltex and or a double layer of Craft Fuse are the only options that yielded a functional slide pouch. Substituting fusible fleece, Soft & Stable, or Shape Flex will not work properly. To make your pouch, start by fusing your interfacing to the wrong side of your Main Pouch Exterior pieces, aligning the long bottom edges. If using the Craft Fuse, you'll be fusing two layers of interfacing directly on top of each other. Now follow the the instructions for Noodlehead's Open Wide Pouch. There are only a few differences. First is the dimensions of your pieces, but that doesn't affect the process. (Note, all my measurements are width x height.) Use the same seam allowances she calls for as well. Second, you'll want to leave a smaller, 3" opening in the lining for turning. 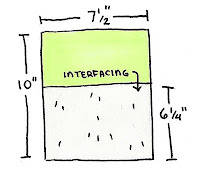 Third, when boxing the corners, the marked line should measure 2.5" long instead of 3.5". Follow her instructions but stop BEFORE you topstitch around the pouch opening at the end. Skip to the end of her instructions and attach the Zipper Tab. Fold the Pull Tab in half vertically, WST and press. Unfold and then fold the edges in to meet the crease and press. Refold in half, yielding a 5" long piece of 1" wide double fold tape. Stitch 1/8" along each 5" edge, then cut in half to yield (2) 2.5" long tabs. Fold Them in half horizontally, press, and baste closed. Fuse the interfacing to the wrong side of the Contrast Band. Press the 13.5" edges your Contrast band .5" to the wrong side. Fold the contrast band in half wrong sides together (WST), aligning the folded edges and press. This will make it easier to get your band in the proper position later. Unfold the Contrast Band and fold it in half vertically, right sides together (RST), aligning the 9" edges. Pin and sew with a .25" seam allowance. Press the seam open and turn the tube right side out. The previous pressing you did should make it easy to fold the tube in half WST so that you have a 4" tall tube with the raw edges folded in. Set aside. 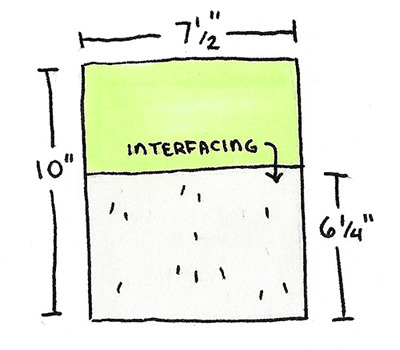 Measure 6.5" from the seam on the Contrast Band and mark with a water soluble marker along the top and bottom edge. Insert the basted end of one Pull Tab .5" into the open side of the Contrast Band, centering it with the seam. Baste in place. Do the same with the remaining Pull Tab, centering it with the line you marked. Pin the open edges of the Contrast Band closed and topstitch with a 1/8" seam allowance. Slip the Contrast Band over the pouch with with the pull tabs pointing towards the bottom of the pouch. Align the top folded edge of the Contrast Band with the top edge of the pouch. Don't cover any more of the zipper tape. Line up the side seam with one of the side seams of the pouch and pin. Line the marked line up with the opposite pouch side seam and pin. Pin around the remainder of the pouch, lining the Contrast Band up with the top edge of the pouch. Make sure your pouch lining is neatly pressed inside, then topstitch the band to the pouch with 1/8" seam allowance. You're using the topstitching step from Noodlehead's tutorial to attach the Contrast band. Your pouch is finished! The pouch at the top of the post was made with my Witchy Objects print from Spoonflower, black linen, and Craft Fuse. The pouch below was made with Cotton + Steel cotton/linen canvas prints and Peltex. And here's a video of the bag in action. Just pull the tabs to convert use as a pen cup, then pick it up by the zipper and give it a little shake to go back to its full height.